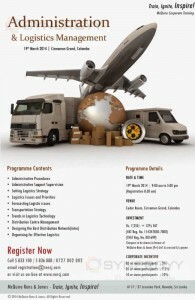 The Ceylon Chamber of Commerce (CCC), in association with the Department of Sri Lanka Customs and supported by DFCC Bank and DFCC Vardhana Bank will hold a series of half-day seminars on export and import procedures in order to educate the trade. The seminar is with an objective to avoid unexpected encounters in Imports and exports even those with years of experience. 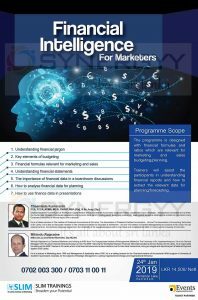 The seminar organised by the Ceylon Chamber of Commerce and gives practical information that will help protect your company’s interests and maximize your opportunities in the global market place. The seminar will cover areas such as goods classification and harmonized system, import procedures, goods valuation, export procedures, export facilitation, bonding and entrepot trade. 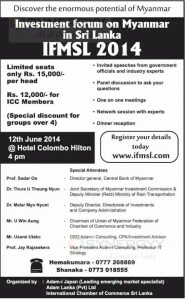 The procedures on Export facilitation, bonding and entrepot trade will be discussed at the Ceylon Chamber on July 21, 2014. 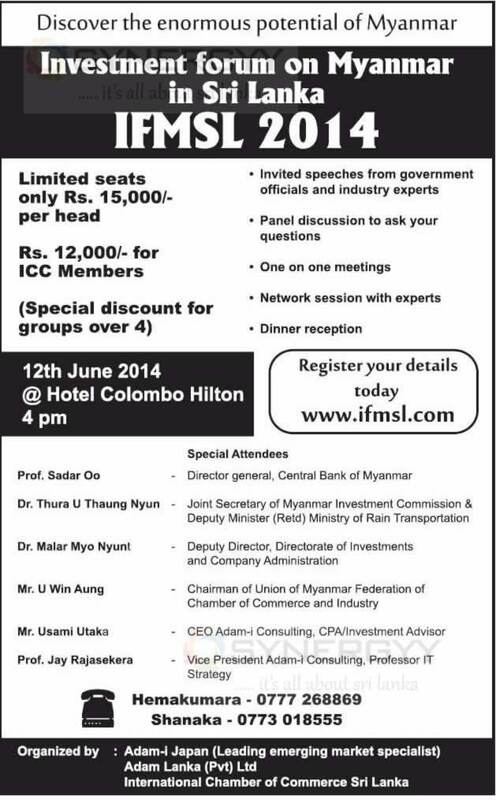 The presentation will be done by Customs Deputy Director S. Nethkunananthen. All three events will be held from 9:00 a.m. to 12:30 p.m. on each of the dates. To register for these seminars contact Sriyani on 5588877 or email: Sriyani@chamber.lk. 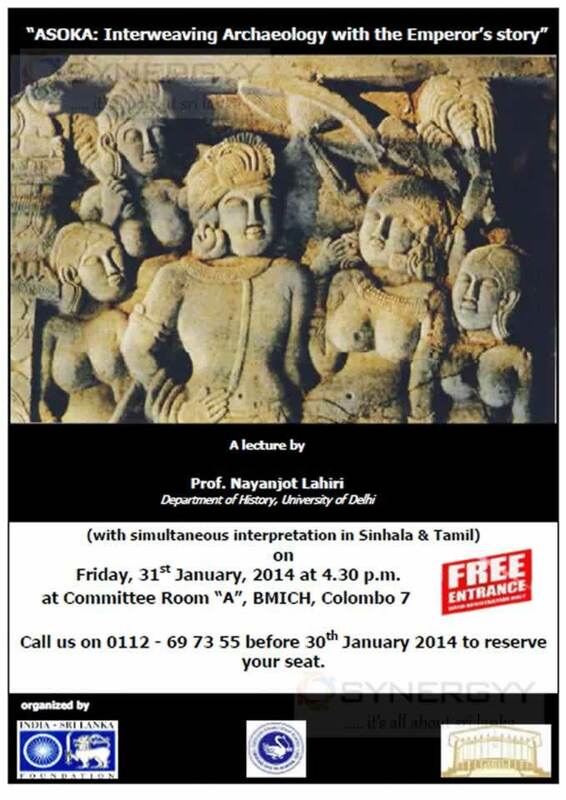 Dr. Shihan de Silva Jayasuriya, Senior Fellow at the Institute of Commonwealth Studies, University of London will deliver a lecture on, “Sri Lankans of African Descent: Heritage, Identity and Connectivity” at the ICES Auditorium at No: 2, Kynsey Terrace, Colombo 8 on Thursday, 10th July 2014 from 4.30 pm. Dr. Shihan de Silva Jayasuriya is a past member of the UNESCO International Scientific Committee (Paris) and an elected Fellow of the Royal Asiatic Society (Great Britain & Ireland). She is the author of numerous monographs and two edited books in the field of Historical Linguistics. 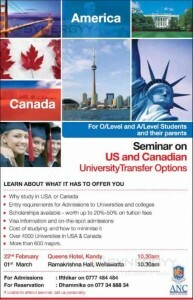 Time: 08.30 A.M. – 01.00 P.M.
Venue : Sri Lanka Foundation Institute, No : 100, Independence Square, Colombo 7. Mr. B.D.U.Jayanetti – Former Commissioner of Inland Revenue, LL. 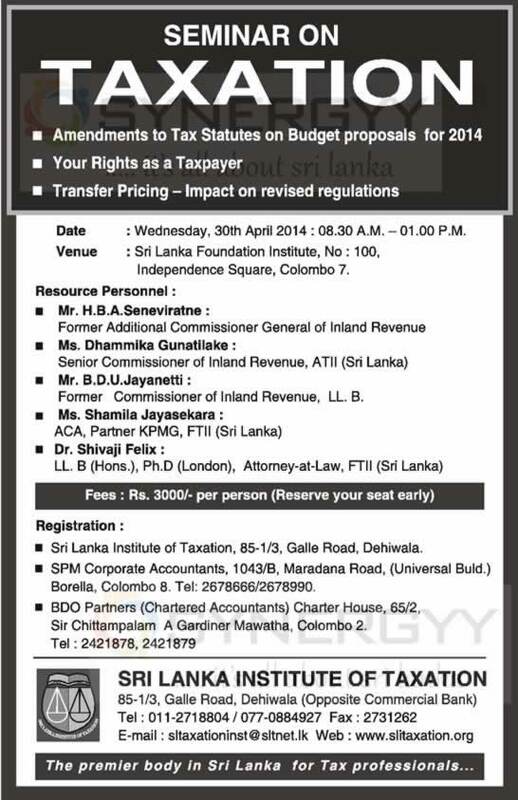 B.
Sri Lanka Institute of Taxation, 85-1/3, Galle Road, Dehiwala. 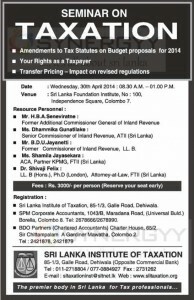 SPM Corporate Accountants, 1043/B, Maradana Road, (Universal Buld.) Borella, Colombo 8. Tel: 2678666/2678990. 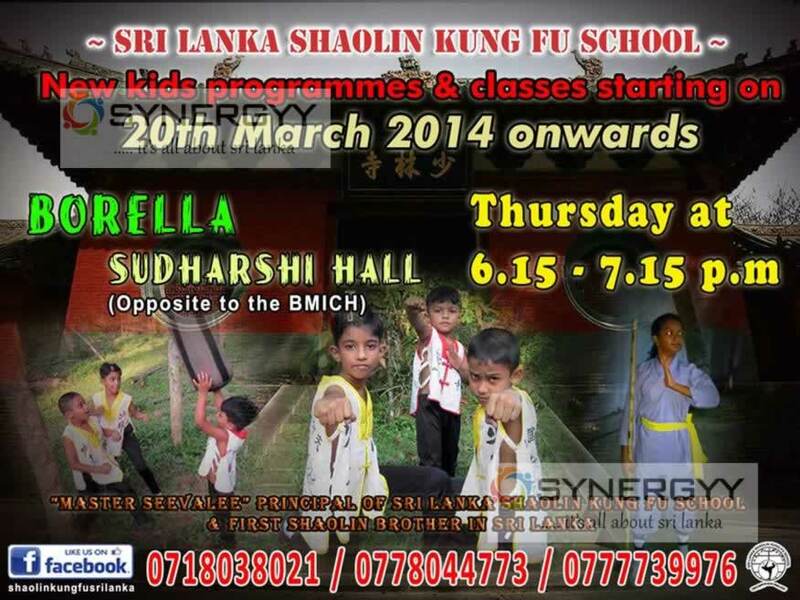 The Master Seevalee principal of srilanka Shaolin kung fu school and first Shaolin brothers in Srilanka conducted Shaolin Kung Fu classes in Borella, Colombo. Human resource is the most precious resource in any organization. It is the only resource that can command and control the other resources. The people factor for organizational performance is of extreme importance due to this reason. Every manager is a people manager. Ensuring proper employee care will lead to better customer care. 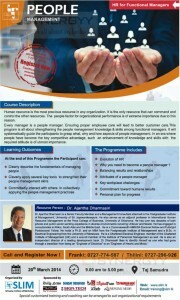 This program is all about strengthening the people management knowledge & skills among functional managers. It will systematically guide the participants to grasp what, why and how aspects of people management. In an era where people have become the key competitive advantage, such an enhancement of knowledge and skills with the required attitude is of utmost importance. Why you need to become a people manager ? 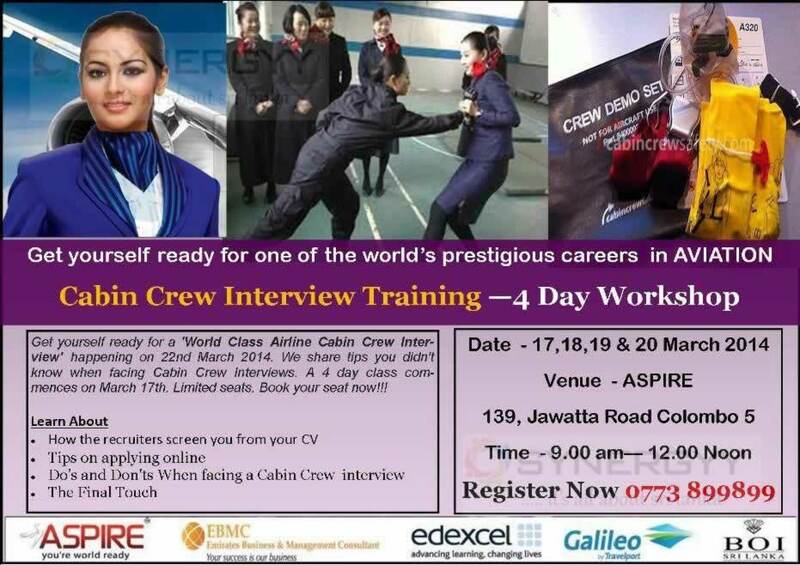 We share tips you didn’t know when facing Cabin Crew Interviews. 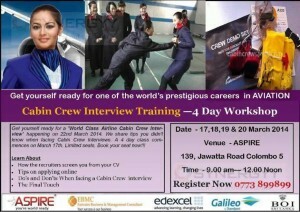 A 4 day class commences on March 17th. Limited seats. 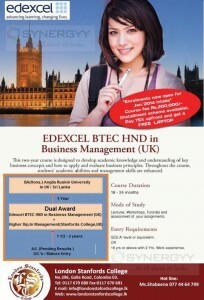 Book your seat now!!! 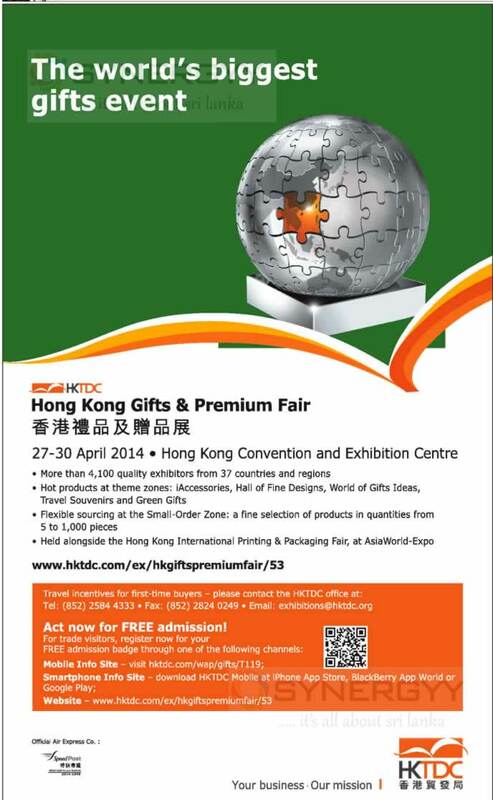 The HKTDC invites applications from Srilankan Gifts & Premium enterprises to participate on upcoming Hong Kong Gifts & Premium Fair on 27th to 30th April 2014 at Hong Kong Convention and Exhibition Centre. 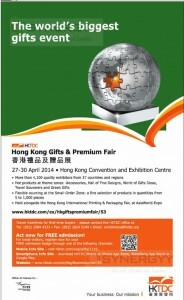 Act now for FREE admission! 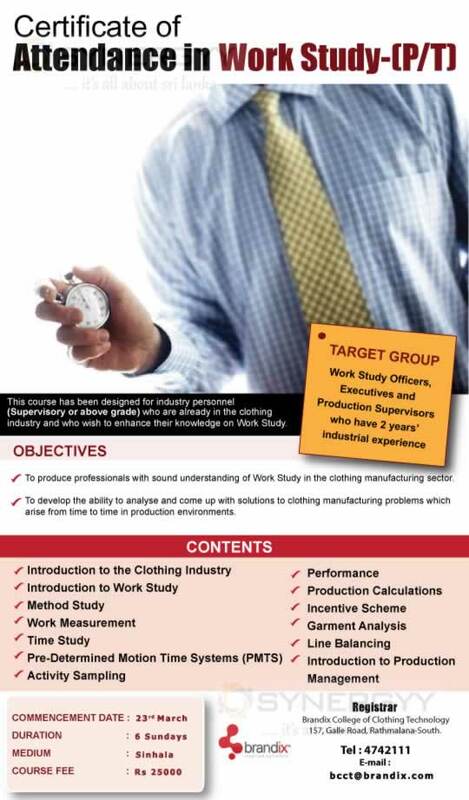 This course has been designed for industry personnel (Supervisory or above grade) who are already in the clothing industry and who wish to enhance their knowledge on Work Study. 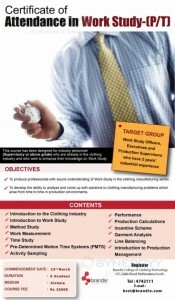 To develop the ability to analyse and come up with solutions to clothing manufacturing problems which arise from time to time in production environments. The three day Supervisory Development program designed and conducted by IPM, is a comprehensive and interactive learning experience geared to assist each participant in becoming a better and confident supervisor. Topics covered include the most-frequently mentioned supervisory training needs. This three day training program will be a starting point of a long term supervisory skills development program of Supervisors and similar level of employees of private sector and government sector organizations. 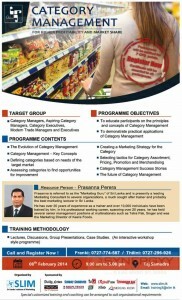 Enhancing the confidence level of the Supervisors by educating them on basic supervisory knowledge and basic supervisory skills and encouraging them to develop ownership and responsibility for their supervisory effort for better results. Supervisors also will be encouraged to continuously learn on areas relevant to them on supervisory management and to become effective and efficient supervisors in their organizations. Power point presentations, readings, individual and group activities, brain storming sessions, group activities, video clips, and discussions. 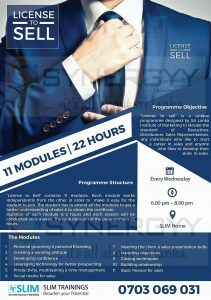 All these concepts will be taught to suit the level of responsibility of participants so that they would understand these concepts in relation to their jobs. 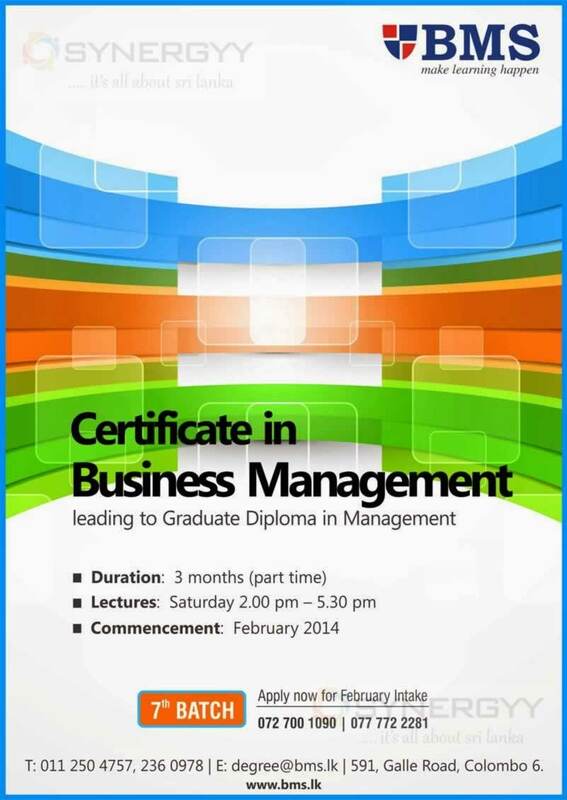 This learning will help them to understand the worth of their commitment, efforts and loyalty to the company. We revolutionize lives of your staff & Take them to the most triumphant new lives through latest NLP techniques. 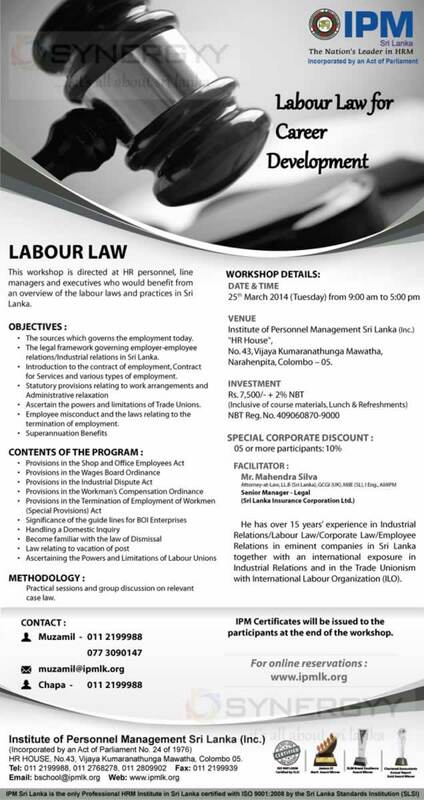 This workshop is directed at HR personnel, line managers and executives who would benefit from an overview of the labour laws and practices in Sri Lanka. The sources which governs the employment today. 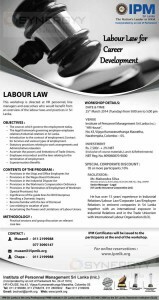 The legal framework governing employer-employee relations/industrial relations in Sri Lanka. Introduction to the contract of employment, Contract for Services and various types of employment. Ascertain the powers and limitations of Trade Unions. Employee misconduct and the laws relating to the termination of employment. He has over 15 years’ experience in Industrial Relations/Labour Law/Corporate Law/Employee Relations in eminent companies in Sri Lanka together with an international exposure in Industrial Relations and in the Trade Unionism with International Labour Organization (ILO). 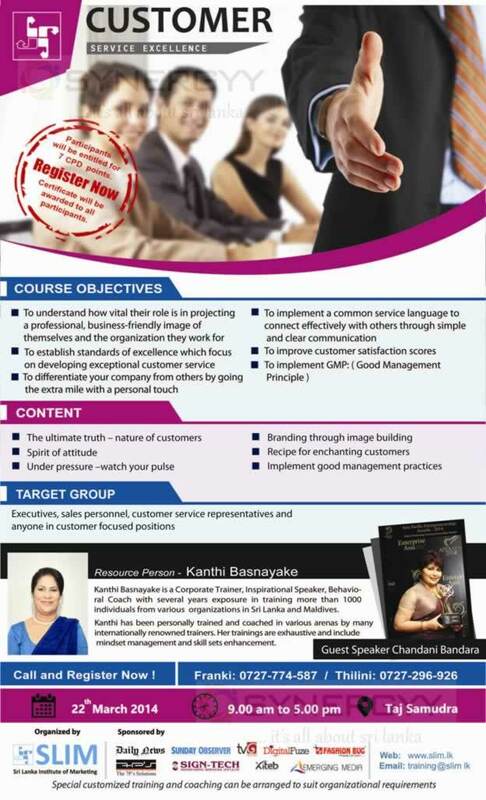 Kanthi Basnayake is a Corporate Trainer, Inspirational Speaker, and Behavioral Coach with several years’ exposure in training more than 1000 Individuals from various organizations in Sri Lanka and Maldives. Kanthi has been personally trained and coached in various arenas by many internationally renowned trainers. Her trainings are exhaustive and Include mindset management and skill sets enhancement. 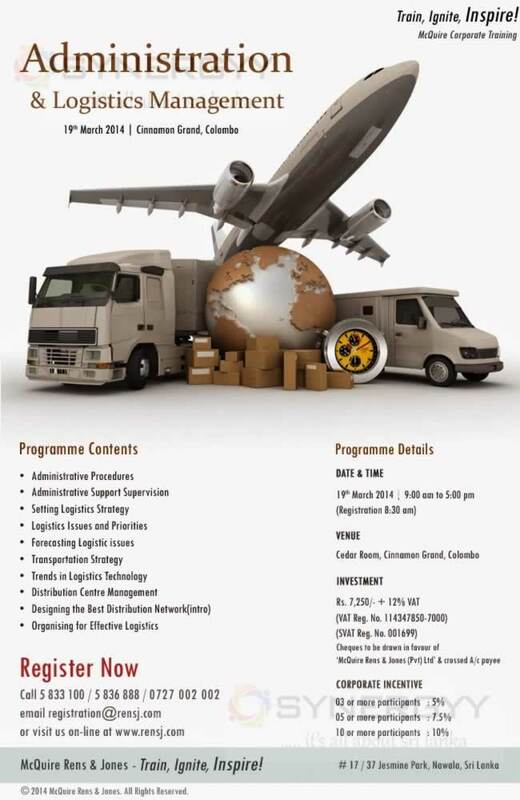 The McQuire Rens & Jones organize an Administration & Logistics Management Workshop on 19th March 2014 at Cinnamon Grand Hotel, Colombo. 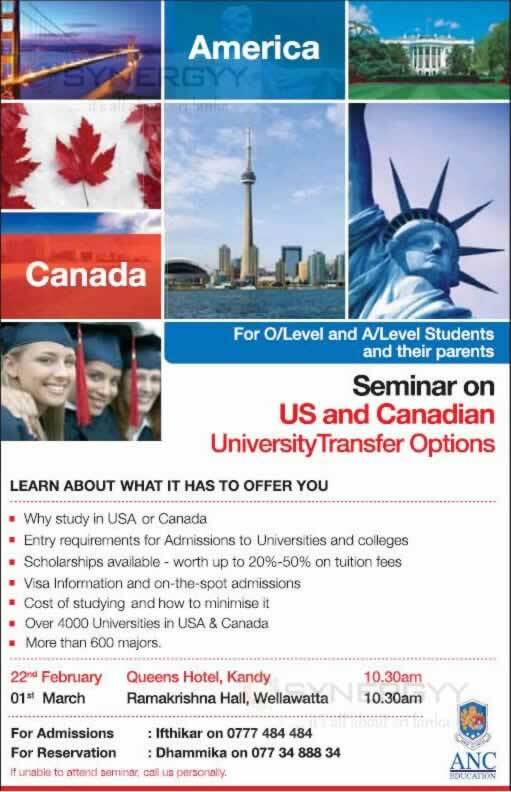 The ANC organised a Seminar on US and Canadian University Transfer Options for O/Level and A/Level Students and their parents. 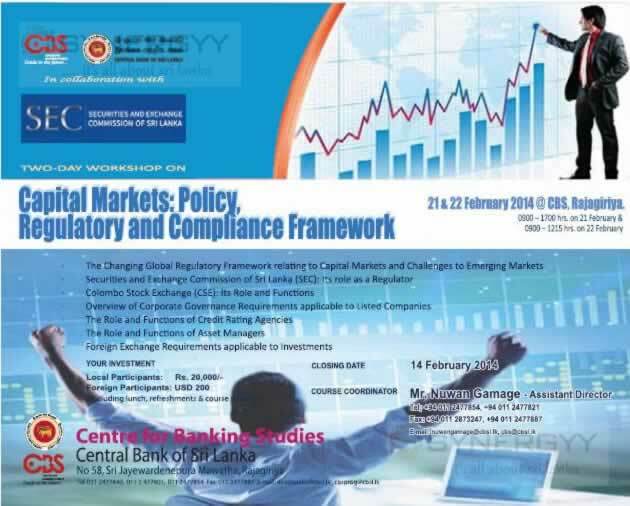 The Securities and Exchange Commission of Sri Lanka organised a 2 days’ workshop on Capital Markets: Policy, Regulatory and Compliance Framework on 21st and 22nd of February 2014. 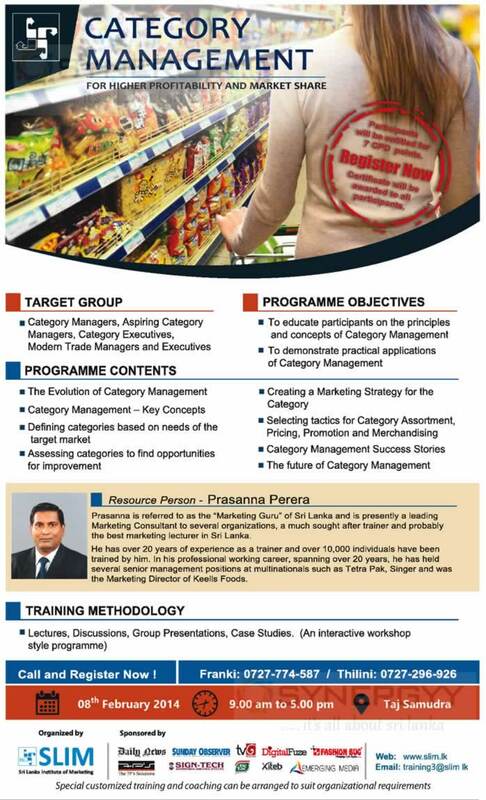 SLIM organise a Category Management Workshop on 8th February 2014 by Prasanna Perera at Taj Samudra Hotel. 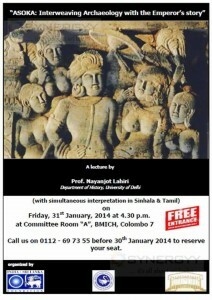 BCIS in collaboration with the India-Sri Lanka Foundation is organizing a public lecture on “Asoka:Interweaving Archaeology with the Emperors Story” on Friday, 31st January 2014 from 4.30pm to 5.30pm at the BMICH Committee Room A.
Lecture will be conducted in English by Prof. Nayanjot Lahiri from University of Delhi and simultaneous interpretations are available in Sinhala and Tamil. 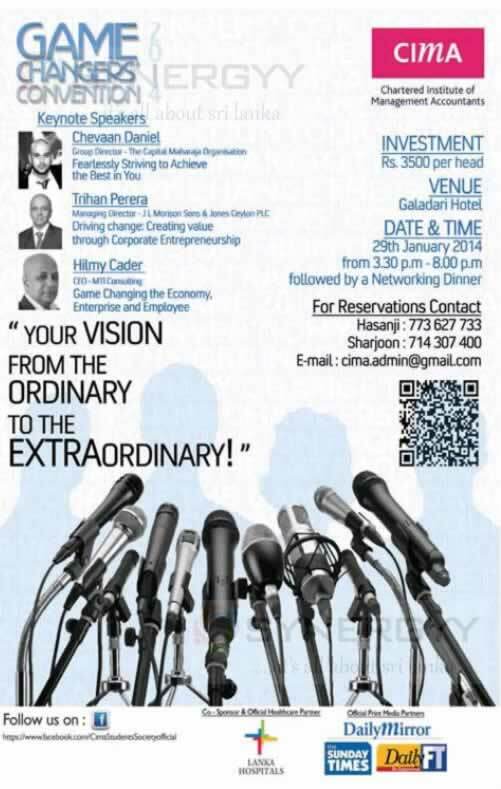 CIMA Srilanka Organised an event of CIMA Game Changers Convention on 29th January 2014 at Galadari Hotel, Colombo. 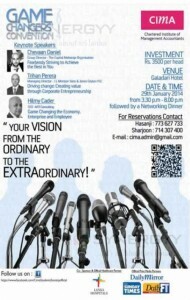 The event will you make you from Ordinary person to the Extraordinary person with key personals of Chevaan Daniel, Trihan Perera and Hilmy Cader. Mr.Deepal Perera is a leading tutor for the Airline and cabin crew training in srilanka with wide range of experience. 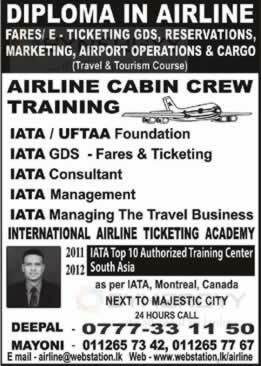 Many of his students are working for the leading airlines around with world and he proofs him as a leading lecture and mentor for the Diploma in Airline and Cabin Crew couching. 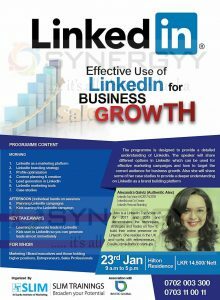 The Strategy organised a skill salad a 5th consecutive programme for skill development on 4th January 2013 for Free of Charge.